The Artist swept all before it at Sunday night’s BAFTAs, winning seven awards, including Best Film, Best Director and Best Actor. Tinker Tailor Soldier Spy won for Best British Film and Best Adapted Screenplay, tying with Hugo, The Iron Lady and Senna on two awards each. The BAFTAs had threatened to buck the trend of the French silent-movie winning all of the major awards it was up for, with the adaptation of Le Carré’s spy thriller looking like a strong contender as the flag-bearer for British film this year. 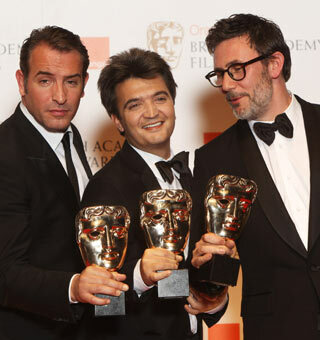 However, BAFTA demonstrated its admiration of The Artist by awarding it the most awards of the night by far, including a surprise win for Jean Dujardin in the Best Actor category, an award which Tinker Tailor’s Gary Oldman had been expected to win. The results of the BAFTAs confirm that The Artist should win big at the Oscars in a fortnight’s time. Its main contender there, Hugo, won two technical awards tonight (Best Production Design and Best Sound), which does not amount to a much of a challenge. The Artist is now the overwhelming favourite for Best Actor, Best Director and Best Picture at the Oscars. Director, Michel Hazanavicus, whilst collecting his award for Best Original Screenplay, thanked the "very clever" British people for recognising his film. It was not a bad night for Tinker Tailor, though it could have gone better. In an awards season where The Artist has been anointed the universal favourite, at least the superb spy thriller got some recognition tonight. Its award for Outstanding British Film was thoroughly deserved, and Peter Straughan gave a very moving acceptance speech for his award for Best Adapted Screenplay, paying tribute to his late wife and co-writer Bridget O’Connor with emotion and not a little style. Having lost the Screen Actors’ Guild Award for Best Actress, Meryl Streep restored her winning streak tonight, collecting the award for her role as Margaret Thatcher in The Iron Lady (which also deservedly won for Best Make-Up and Hair). At the Golden Globes, she thanked the Brits for allowing her to “trample over” our history. Tonight, Britain’s main awards body rewarded her for doing so, and producing a truly great performance in the process. She does face a challenge from Viola Davis for the Oscar, but she does remain the favourite. Christopher Plummer was not around to collect his award for Best Supporting Actor for Beginners, but Octavia Spencer was genuinely surprised to get some non-American recognition for her gutsy performance in the civil rights drama The Help. Both continue their march toward Oscar glory. The British film Senna won the documentary award as well as the prize for editing, and it was terrific to see it get some recognition, particularly as the Oscars failed to include the film on its longlist. There was also worthy reward for the visual effects team on Harry Potter who, across eight films in the series, hadn’t yet won an award. There were warm ovations for John Hurt, who won the Outstanding British Contribution to Cinema award, delivering the best speech of the night in the process, and for Martin Scorsese who was truly humbled upon receiving the BAFTA fellowship. The Artist also collected awards for Music (Kim Novak is filing a lawsuit as you read), Costume Design and Cinematography. Rango won for Best Animated Film, whilst there was a shock when the Iranian film, A Separation, lost the Best Foreign Language Film award to The Skin I Live In. The gritty drama Tyrannosaur won the Best British Debut award, but there was an almost totally unexpected result when Adam Deacon beat Eddie Redmayne and Tom Hiddleston to the Orange Rising Star award.